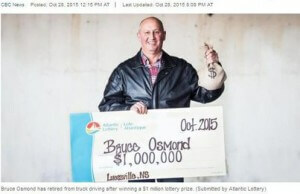 When Nova Scotia truck driver Bruce Osmond finally hit a big lotto jackpot, he instantly knew what to do. Within 3 hours of winning a $1 million on Lotto 6/49 Osmond had quit his job and decided to sell his rig. The winner recalls feeling awesome after the win and is now looking forward to a more comfortable life free from early morning alarm clock rings. In fact, he wants to go visit family in Newfoundland and spend more time with his grandchildren.